My dessert pie for national pie day. I was inspired a bit by Develyndeskyes response to my twitter. She had suggested a chocolate silk pie…so while I was thinking about chocolate silk in my kitchen some bananas caught my eye. Ha! Get some fruit in there make it tasty and healthy. This is a gooey pie simply because that is what I wanted, a pudding pie. If you want a firmer pie you can always fold in some fat free cool whip or something. It does hold shape somewhat but not much. Just messy good times. Combine the cookies and margarine. Press into the bottom of a pie plate to cover the bottom. 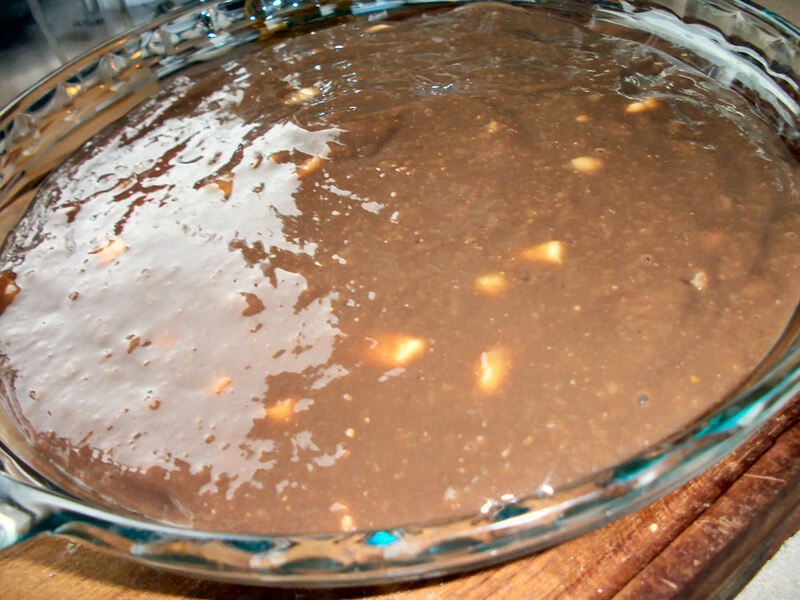 Whisk together chocolate pudding mix and 1 cup of skim milk until it begins to thicken usually about 3 minutes. Puree 1 banana and 1/2 cup of milk. Add the puree to the pudding. Cut the remaining banana into slices, break apart the slices where the banana naturally segments. Usually into three pieces per slice. Stir the banana chunks into the pudding carefully. Pour the pudding mixture over the pie crust and refrigerate atleast 4 hours or overnight. Serves 8. Each serving contains 124 calories, 1.6 grams of fat and 1.2 grams of fibre. This tasty pie sure didn’t last long in our fridge! This entry was posted in Dessert and tagged almond, Banana, chocolate, pie. Bookmark the permalink.